The time has finally come to let Swedish reinforcements loose on the battlefield. Along with the new Tech Tree which introduces some cool new mechanics, we’ve also buffed a number of Premium vehicles based on your feedback. Here's the final round of info you need to know before rolling out in 9.17. World of Tanks servers will be down on 14 December from 2:00 to 8:00 CEST (UTC +1) to get everything in order. Also, we’ll be freezing the Global Map for 24 hours, temporarily closing the Clan portal and cancelling Strongholds battles (except skirmishes). In the weeks leading up to release, we revealed details about the update's new content in a series of posts. Click the images below to jump to more detailed coverage. The Swedish tree comes in two flavors: tank destroyers and a mixed branch. The TDs are lightly armored, making them quick off the mark. They can bring the pain with their decent guns and stay safe with their low silhouettes. At tiers VIII–X, the TDs introduce Siege and Travel modes. The former considerably ramps up your ability to deal damage. The latter is for when you need to secure your position. The mixed branch has light, medium and heavy tanks. Early-to-mid tiers have good elevation arcs and can slip into a number of combat roles. At the higher end, the EMIL I, EMIL II, and Kranvagn have the nation’s trademark gun depression and autoloaders. Thanks to your feedback, we’ve built on the first round of changes to several Premium vehicles, tweaking the combat parameters of the FV4202, STA-2, M4A1 Revalorisé, T26E4 SuperPershing, WZ-111, Löwe, Panther 8.8, T34, M46 Patton KR, and 112. Improvements were also made to the French heavy tanks АМХ 50 В and АМХ 50 120. The revised overmatch and ricochet rules (initially planned for 9.17) were postponed. All the data and your feedback from the Common Test showed that their introduction could lead to some deeper changes to vehicles strong and weak spots. Just like you, we wouldn’t want that. That's why we're taking some extra time to fine-tune these elements. Until it's all ready and meets our high standards of quality, we’ll stick to the old, time-proven mechanic for all vehicles, including the Swedish TDs. Head over to the 2nd Common Test article for more details. 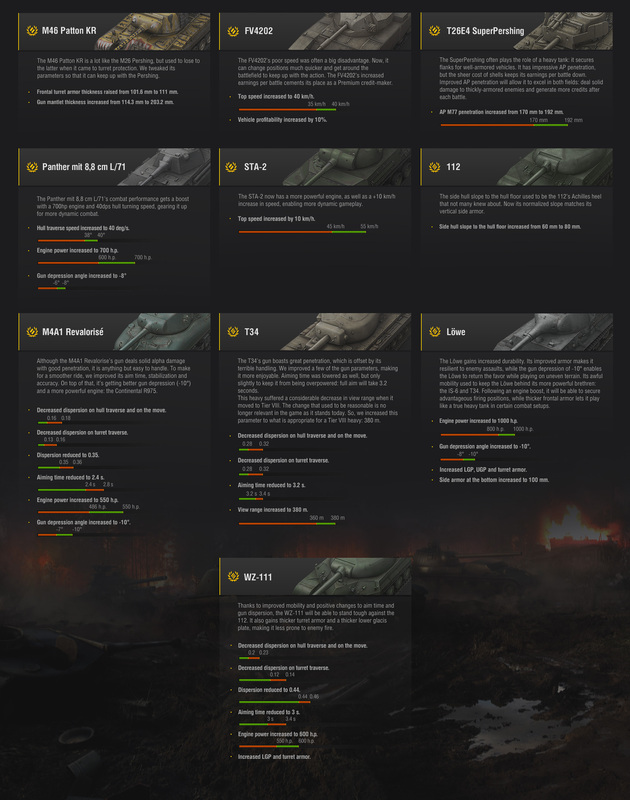 As usual, your contributions during the test period were extremely helpful in making World of Tanks a better game. Head to the forums, talk to your fellow tankers, and let us know what you think about the final release! Removed the Ranked Battles tab from the Missions window, since the mode is no longer available in the game. Added the first-person view for Spectators in Training Rooms. Increased the maximum number of participants (including Spectators) in Team Training and Special Battle modes to 20 players. The number of team members remains limited to 15 players. Implemented configuration presets for 5.1\7.1 surround systems that can be enabled by players in the Settings. Reworked the system of collision with indestructible objects and other vehicles. Added a sound for the Auto-Aim: the "locking on a target" event is followed by a sound notification. Implemented an option that re-configures the Push-to-Talk button in the Sound tab (previously the button could be reconfigured only in the Controls tab). Enabled award windows for completed missions (previously award windows were enabled only for Personal Missions). Restored transition between related missions in the Missions window. Implemented the feature of saving the compared vehicles between game sessions. Fixed the issue of improper display of the solid aiming circle. Fixed the issue of driving to map areas that are not intended for playing on the following maps: Pilsen, Karelia, Serene Coast. Increased engine power of the Maybach HL 230 P30 engine from 600 h.p. to 700 h.p. Increased engine power of the Maybach HL 230 engine from 800 h.p. to 1000 h.p. Improved engine power of the NORINCO 12150L engine from 520 h.p. to 600 h.p. Improved engine power of the Continental R975 engine from 460 h.p. to 550 h.p. Increased engine power of the Mitsubishi 12HM20WT engine from 500 h.p. to 570 h.p.